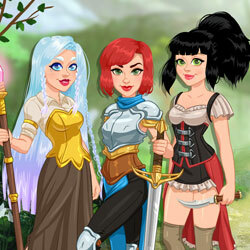 Description: Enter in a world full of fantasy and discover the beauty of RPG Dress Up. Are you a strong warrior? A cunning rogue? Or perhaps an insightful mage? Choose your favorite attire for each of the three adventurers and have fun in this world of sword and sorcery!